For more information, call the Renton Senior Activity Center at 425-430-6633 | 15 Policies We do not provide respite care, adult daycare, and/or services that would normally be provided by a trained attendant, nurse or personal caregiver (i.e., incontinence, inability to use the rest- room independently or preventing a participant from leaving the facility). In addition, the provision of any personal care by staff for a participant is beyond our capability. Senior adults with special needs may be eligible for other community-based programs. For more information, contact Full Life Care at 206-528-5315. This brochure is for informational purposes only and is subject to change without prior notification. The programs offered at the Renton Senior Activity Center are designed to be useful and informative. We do not endorse any product or program that is presented. It is the individual's responsibility to make informed decisions regarding these issues. All announcements, posters, or flyers must be cleared through the Recreation office. Medical Information Card We encourage all participants to complete a medical informa- tion card, which provides us valuable information in the case of an emergency. Ask for one at the reception desk. Parking Park in designated parking spaces. Carpool or take the bus if possible, and observe the handicapped signs. If you illegally park your car, it may be towed. Do not leave valuables in your car. Overflow parking is available on the backside of Carpen- ter's Hall and at Renton Memorial Stadium. 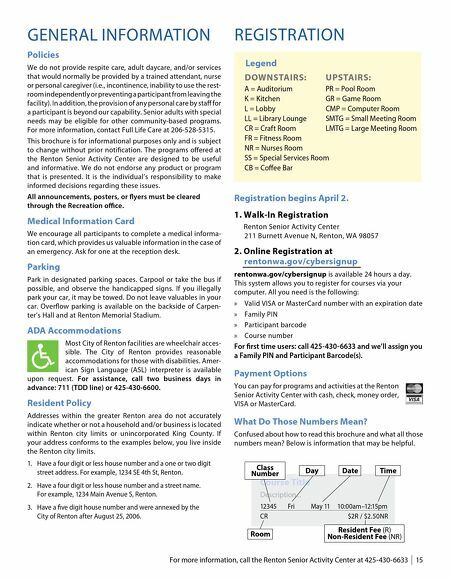 ADA Accommodations Most City of Renton facilities are wheelchair acces- sible. 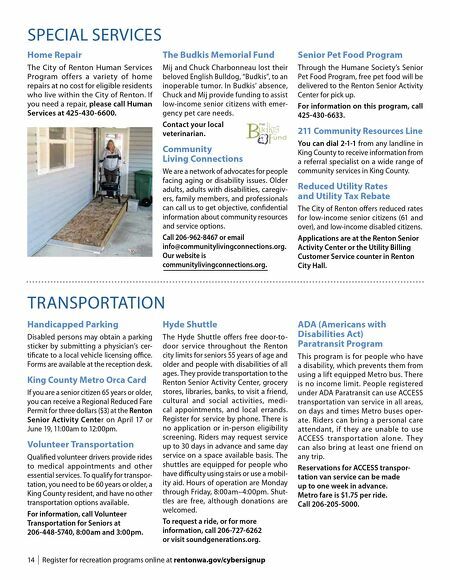 The City of Renton provides reasonable accommodations for those with disabilities. Amer- ican Sign Language (ASL) interpreter is available upon request. For assistance, call two business days in advance: 711 (TDD line) or 425-430-6600. Resident Policy Addresses within the greater Renton area do not accurately indicate whether or not a household and/or business is located within Renton city limits or unincorporated King County. If your address conforms to the examples below, you live inside the Renton city limits. 1. Have a four digit or less house number and a one or two digit street address. For example, 1234 SE 4th St, Renton. 2. Have a four digit or less house number and a street name. For example, 1234 Main Avenue S, Renton. 3. Have a five digit house number and were annexed by the City of Renton after August 25, 2006. Legend UPSTAIRS: PR = Pool Room GR = Game Room CMP = Computer Room SMTG = Small Meeting Room LMTG = Large Meeting Room DOWNSTAIRS: A = Auditorium K = Kitchen L = Lobby LL = Library Lounge CR = Craft Room FR = Fitness Room NR = Nurses Room SS = Special Services Room CB = Coffee Bar REGISTRATION GENERAL INFORMATION Course Title Description... 12345 Fri May 11 10:00am–12:15pm CR $2R / $2.50NR Room Day Time Date Class Number Resident Fee (R) Non-Resident Fee (NR) Registration begins April 2. 1. Walk-In Registration Renton Senior Activity Center 211 Burnett Avenue N, Renton, WA 98057 2. Online Registration at rentonwa.gov/cybersignup rentonwa.gov/cybersignup is available 24 hours a day. This system allows you to register for courses via your computer. All you need is the following: » Valid VISA or MasterCard number with an expiration date » Family PIN » Participant barcode » Course number For first time users: call 425-430-6633 and we'll assign you a Family PIN and Participant Barcode(s). Payment Options You can pay for programs and activities at the Renton Senior Activity Center with cash, check, money order, VISA or MasterCard. What Do Those Numbers Mean? Confused about how to read this brochure and what all those numbers mean? Below is information that may be helpful.